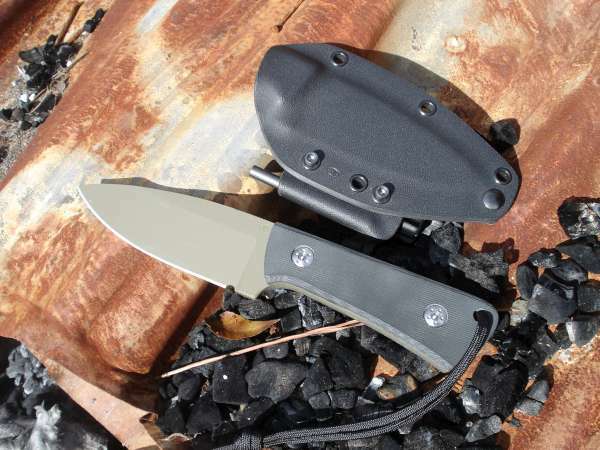 The first Ridge Survival prototype. And a few production Ridge versions in the works. 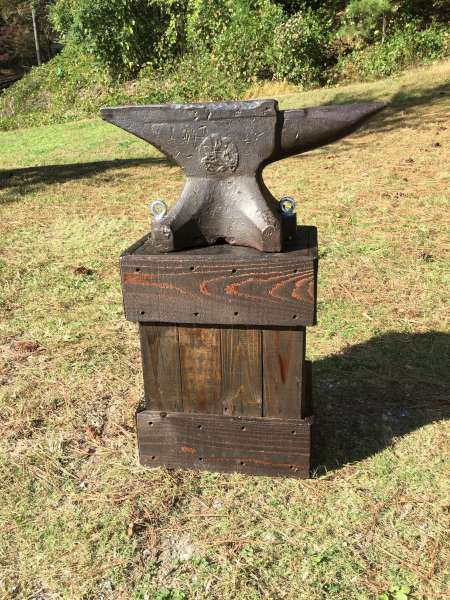 This little guy was made from the handle knock-outs from the knives in the photo above. CPM3V and heat treated like all the rest. 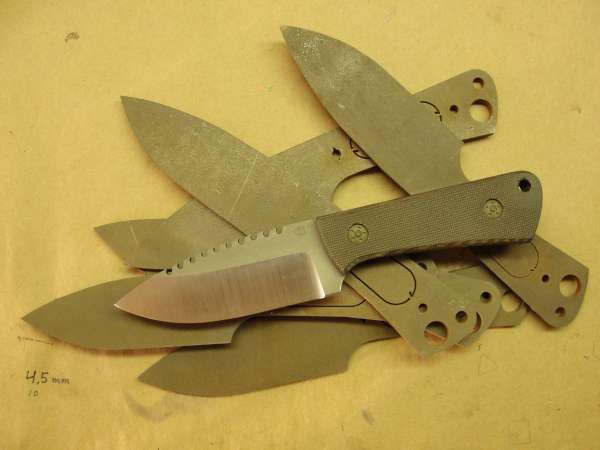 Working with common tools and some water-jet cutting, I produce knives and tools for the outdoors enthusiast. I like to spend a lot of time outside and encourage others to also. Unfortunately, I have to spend a lot of time in the shop as well. With several hours put into every product, there is not as much time to play. Some of my processes are done assembly line style to save time and some work is hired out such as heat treating which helps with consistency of each batch. However; the end product is hand ground, hand assembled and hand finished. I cut out the stock with a band saw and grind the edge profile. Then I rough grind the bevels to get them close to the final dimensions I want. I then grind the profile of the spine of the blade. 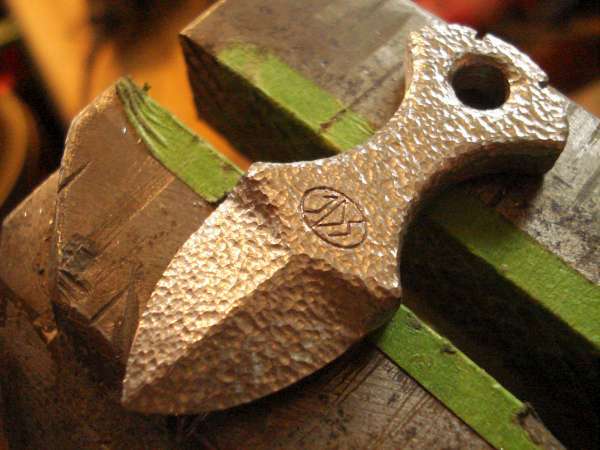 This keeps more steel at the tip when hard grinding the bevels so there is more material to spread out the heat. This slows the heat build-up at the tip. 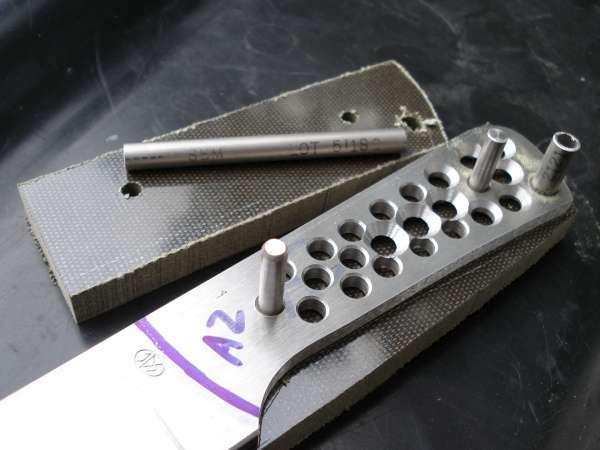 It allows more rapid grinding of the bevel and makes no difference to the time it takes to profile the blade overall. 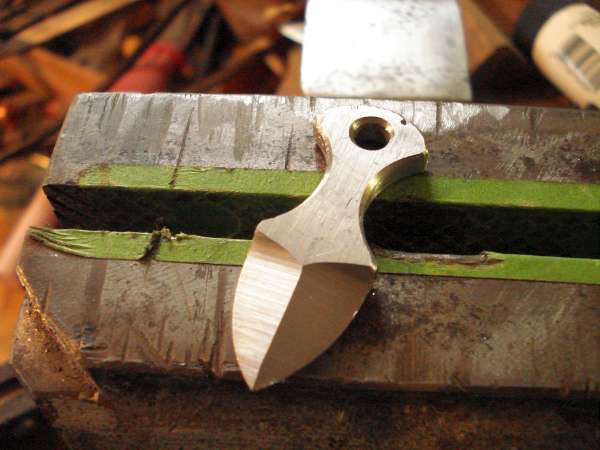 Next I grind the handle profile and drill the pin and lanyard holes and any cut outs to lighten and balance the knife. Some knives have hollow ground or tapered tangs to lighten them. Next I punch the blades with my stamp and the blades are sent to the heat treater. The handles are started when I get the blades back. I rough out the handles and drill the holes for the pins and lanyards. Next the blades are finish ground and the final finish is put on the blade sides and taped up to protect the finish. The the handle scales are bolted on to the tang and ground to match the tang's profile. Contouring and finish sanding brings the project to a point where it's starting to look like a knife. Many of the knives get a blast, acid or stone washed finish so the tape is striped off and they go to the blast cabinet. Next the knife is cleaned and the blade has fresh tape put on. The thermo-formed sheaths are formed with the tape on the blade. This is a summary of how it gets done here and some methods change from time to time. 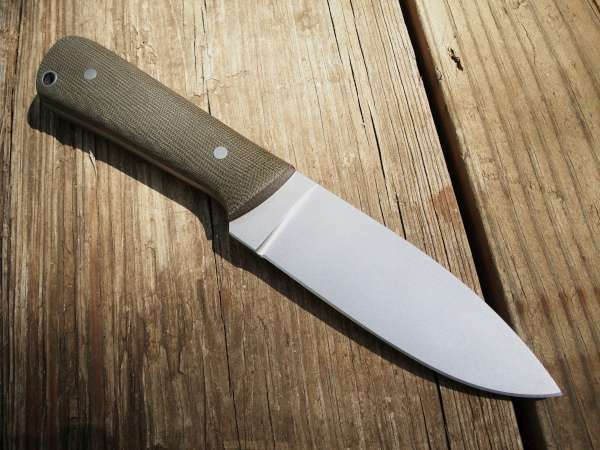 As new tools are aquired for the shop and I learn new techniques, my methods will be altered to take advantage of this but it is a pretty simple process to build a full tang knife. Getting handle scales ready. OD Green canvas and titanium hardware on this one. 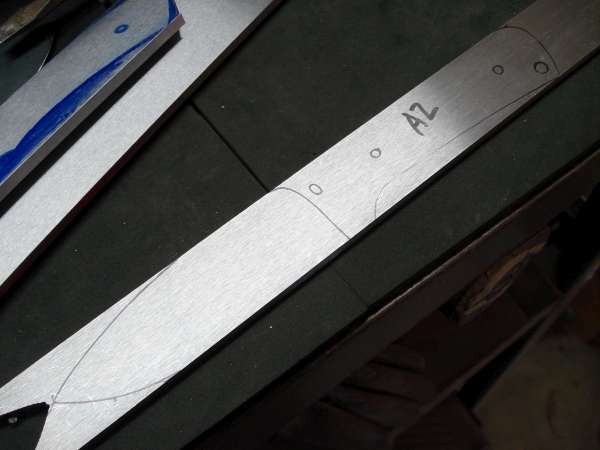 A2 Tool Steel Cruiser ready for the field. 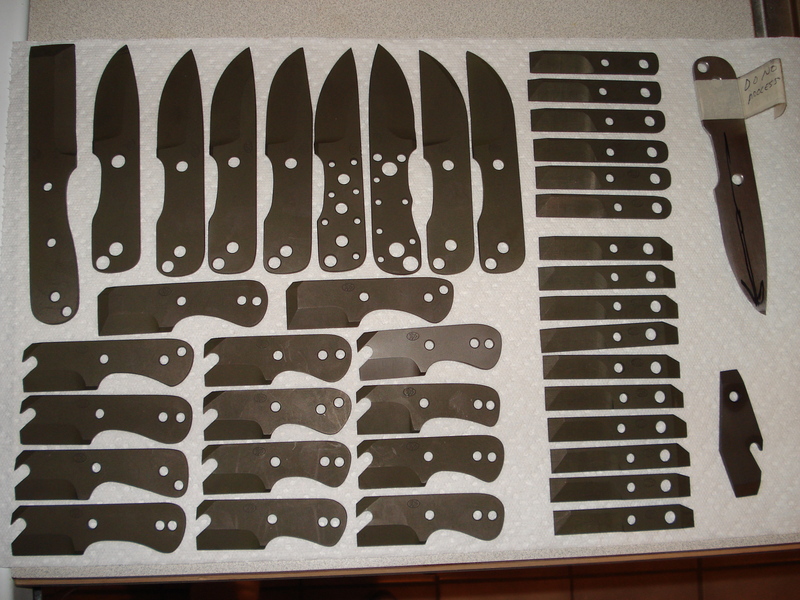 The very first batch of Ebots and Spy Knives as well as some Pry Knives and other stuff. All early versions were hand cut. 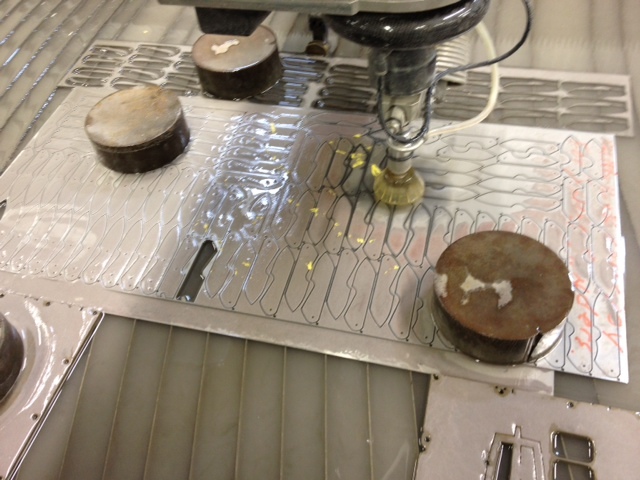 April 2012 started water-jet cutting Ebot, Verge, Sage, and M.E. models seen above. Copyright © 2019 etowahedge.com. All Rights Reserved.